The Uprising Storm has arrived! Now the ground under Manhattan quakes as Hercules enters glorious combat with Castrophobia - the new God of War! But Hercules does not fight alone! So says Gilgamesh, who drags their former foe Ire of Cura-Before-The-Ice into the battle as well. But can three demigods stand up to the might of a new deity, fresh in his power? Given the nature of the character, one might expect a Hercules series to be non-stop action. While the current run has not lacked in thrilling battles, it hasn't had an issue-long fight scene until now. Thankfully, Dan Abnett is as skilled in writing such things as he is in the wonderful world-building Hercules has seen before now. 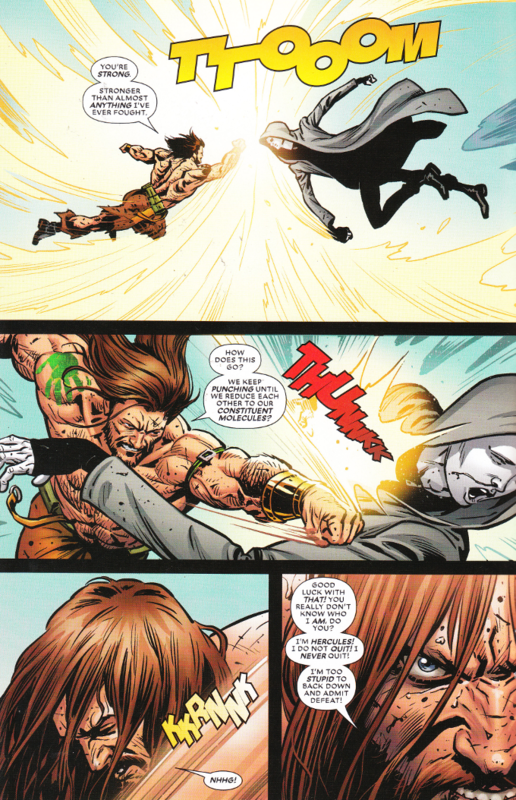 And, even more thankfully, Hercules still isn't written as dumb muscle, even in the heat of a fight. The artwork for this issue is equally epic in scope. Luke Ross draws a damned good fight scene and the action of the issue flows quite naturally from panel to panel. And the colors by Guru-FX are perfectly chosen.